This intensive five-day course takes place at Georgetown University's McDonough School of Business in Washington, DC. 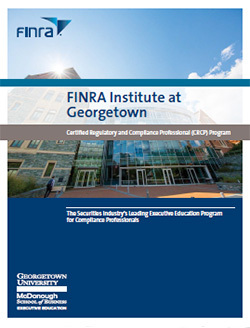 Taught by Georgetown University business and law school professors, industry professionals, and regulators, this foundational course leverages case studies and interactive discussions to arm participants with a broad understanding of the financial services industry and financial regulations. explain new developments in securities regulation, the securities industry and securities markets. Candidates are assigned materials to review in advance of the course work—including rules, regulations, compliance and regulatory guidance, and other relevant readings. Pre-course work is sent out approximately 30 days before each program. There is approximately 20-30 hours of pre-reading per week-long course. View the schedule at-a-glance for our July 2019 course. On the final day of Week I, participants must complete a written assessment. Participants who pass both Week I and II assessments are awarded the CRCP designation. * Price includes registration fees, hotel accommodations, meals and materials. The course schedule is subject to change. Continue to visit this website for the most up-to-date information. Course attendees may receive CLE and CFP credits.